I recently put together a presentation for work to try and instil some more intelligence into folks hashcracking attempts beyond just throwing the largest dictionary possible with a massive ruleset against it and calling it done. As part of that talk I raised the point that installing the Intel OpenCL runtimes for your CPU doesn’t have to be the be all and end all. If you don’t mind a bit of kernel module compilation, you can also have your intel hd graphics do the heavy lifting and you’ll notice some performance gains above your CPU. I last did this a year or two ago and it was incredibly mandraulic and painful, but it turns out there is now a script (or i just plain missed it the first time around) available by intel that providing you’re using one of their “supported” platforms you can run and it’ll handle the dependency hell and installation of the custom kernel. 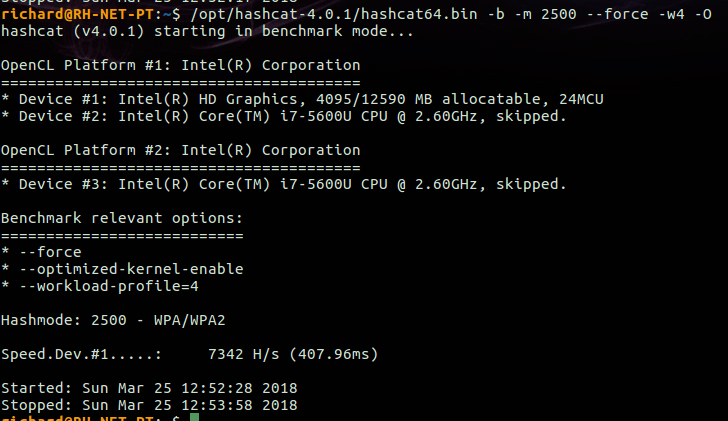 You should note, Hashcat considers the intel gpu runtime to be broken and while booted into the 4.7 kernel I don’t appear to be able to force the selection of my CPU for cracking, though it is listed as an opencl device so whether you still want to go ahead with this is up to you. Warning: The next stage on an intel i7 5600u took just over an hour to complete. Ensure your laptop is plugged into the mains and you’ve got the time to wait in order to compile the kernel. Do a apt full-upgrade and a reboot before starting, then just call the script. Quick Reboot, select the 4.7 kernel in grub and you’re finished! Nice and easy. So this isn’t a definitive sample obviously but here is a comparison between the same benchmark run on CPU vs GPU. So a nice 50-ish% gain in performance. Not quite as high as I seem to remember when I first did this but my memory has been rotted by far too much beer consumption and times change.